The internet is filled with heart healthy food recipes, and we love that because they inspire all of us to eat well, which helps us to stay energized and creates a lifetime of good food habits and choices! Yay for the superfoods! 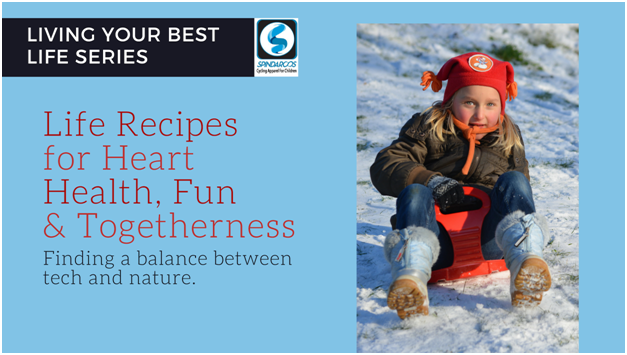 And while eating a healthy diet is extremely important and something we cannot encourage enough, we decided to go a little bit different route with our recipes - we’d like to share some life recipes for living a heart healthy, active and fun-filled life. As we know all too well, our kids are spending more and more time in front of a screen (especially in the winter months) and less time in front of a tree, trail, river or on their bikes having outdoor adventures. We at Spindaroos would like to feature ideas that include a balance between technology and nature. Here are a few cooler weather recipes for a healthy lifestyle we’d like to share. These are some recipes that you’re whole family is guaranteed to eat up! So, get yourself and your kids out there and enjoy a healthy, fun, active life! Pepper in some technology here and there, but make the most vivid flavors of your lives be the memories you’re making by savoring life together.